The total eclipse postage stamp! In June the US Postal Service will release a commemorative stamp to celebrate TSE2017, and it will be a big, big first: a stamp that changes when you touch it. The heat of your finger will react with the stamp’s thermochromic ink to reveal an image of the full moon over a solar corona. It will revert back to a totally-eclipsed sun when it cools. The “Total Solar Eclipse Forever” stamp will be made available on June 20, 2017 after its First-Day-of-Issue ceremony at the University of Wyoming in Laramie. (Am I the only Oregonian disappointed that it’s not taking place in Madras?) Apparently there’s some kind of druid sculpture there that manifests its magical properties on that day, the summer solstice. The image on the new stamp was selected from among Fred “Mr. Eclipse” Espenak’s fine collection of totality photographs, that was shot during the eclipse over Egypt/Libya in 2006. 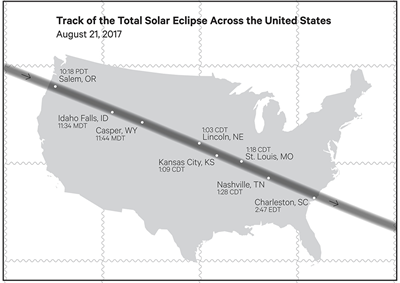 On the back (each pane of 20) will be the path of totality on August 21, featuring the largest cities and towns in the shadow. Learn more (and watch for preorder information) at the USPS website. This entry was posted in Great American Eclipse and tagged corona, eclipse art, eclipse2017, Egypt, Great American Eclipse, National eclipse, philatelic, solar eclipse, total eclipse, total solar eclipse, totality, TSE2017. Bookmark the permalink.